As a young entrepreneur, Jill Kelly is consistently putting the pedal to the metal. But if you ask her about it, it’s clear that she’s enjoying the ride. Kelly is the owner and brand strategist of Red Bicycle Communications, a brand strategy and design firm located in downtown Lloydminster, which has grown progressively since the doors were opened in January of 2014. For the past two years, she has been a finalist in the Young Entrepreneur of the Year category at the Saskatchewan Chamber of Commerce Achievement of Business Excellence (ABEX) awards, and looks to do it again in 2017. Kelly said it’s been exciting working with clients and helping them to grow their brands. Her passion is evident in the name she chose for her business. “I spent a lot of time researching potential names. I looked into what similar companies had in the area, then provincially, nationally and internationally. I wanted something fun and creative and I wanted it not to be just my name,” Kelly said. Kelly’s love affair with the marketing agency concept began shortly after she graduated from the University of Lethbridge. Growing up in Lloydminster, she moved to Halifax to be with her boyfriend (now husband), who was finishing up school. She was eventually hired as an account coordinator by the creative agency Arrivals + Departures (known previously as Extreme Group). After her boyfriend received a job offer back in Lloydminster (his hometown as well), they decided to move back home. Kelly received contract work with King’s Husky, a fuel provider, a supplier of instrumentation and valve products and services throughout Canada. She helped re-brand the company to Kings Energy Group and generated a buzz in the community. That, of course, is exactly what she did. In the beginning, Kelly worked out of her home before eventually making the move to an office. She hired a full-time designer in 2015 and added an account coordinator to the team this year. 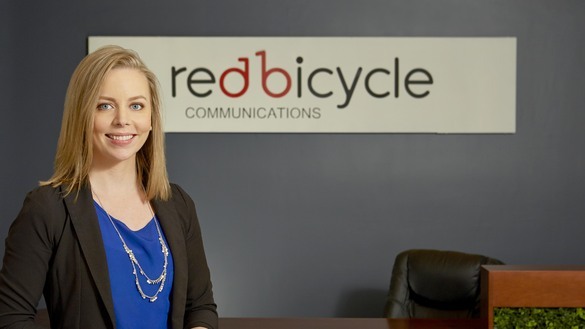 With no other creative agencies in the area, Kelly noted that Red Bicycle has worked hard from the beginning to change the mentality of local business owners concerning advertising and branding. The company has worked with small to medium-sized businesses which Kelly said have traditionally had a small budget and reserved attitude when it comes to marketing. One of the bigger projects Red Bicycle has worked on is a corporate re-brand for the Lloydminster Region Health Foundation, which focuses on enhancing healthcare and promoting innovation through the support of donors. Through the money it has raised, the foundation has done valuable work such as providing new health equipment and enhancing various wards such as orthopedic and maternity. But as Kelly notes, there was one problem. An innovative project Red Bicycle has worked on was spearheading the creation of the popular Lloydminster Local & Traveler’s Guide, developed to help both locals and travelers alike explore all the community has to offer. Kelly was responsible for coordinating a similar project during her time in Halifax and wanted to discover the hidden gems of her own hometown. Her company approached the Lloydminster Chamber of Commerce and struck a partnership. Kelly has been pleased to see more individuals getting into the marketing business in Lloydminster. She co-founded a marketing collective group for those interested in enhancing marketing in the area.